It has been a while since I did anything athletic on my To Do List. Generally, athletic activities are my favorite type of New Thing because they have a good mix of adventure, excitement, and hilarious embarrassment. 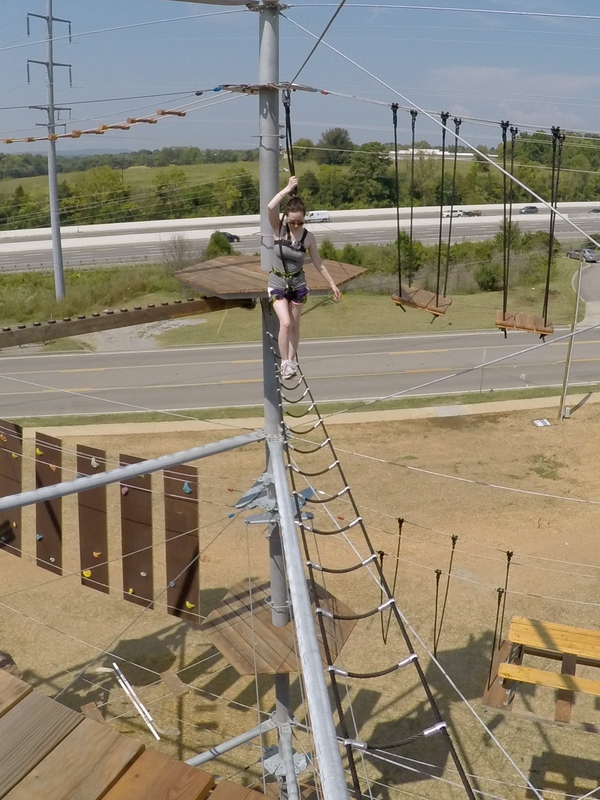 Recently, the Soar Adventure Tower opened near Nashville so I figured it would be a good opportunity to try a ropes course for the first time. The tower has 4 levels with several individual platforms. 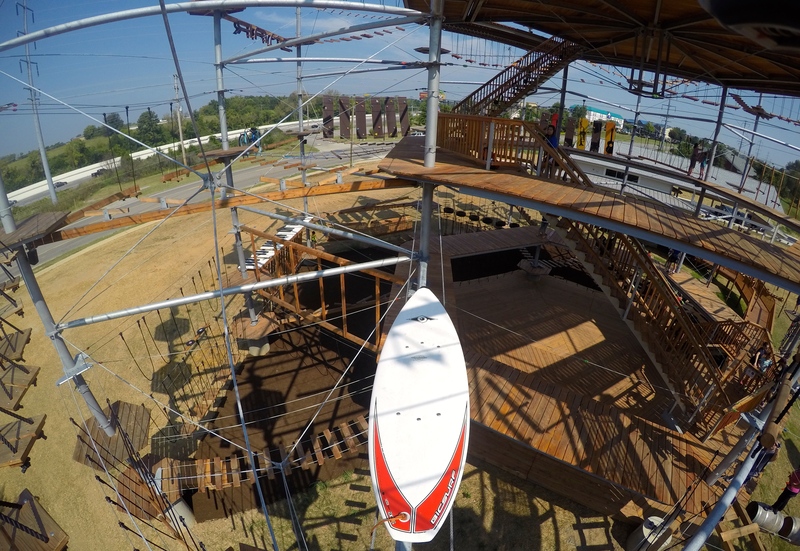 Each platform connects you to 3 different elements, for a total of over 110 climbing adventures. 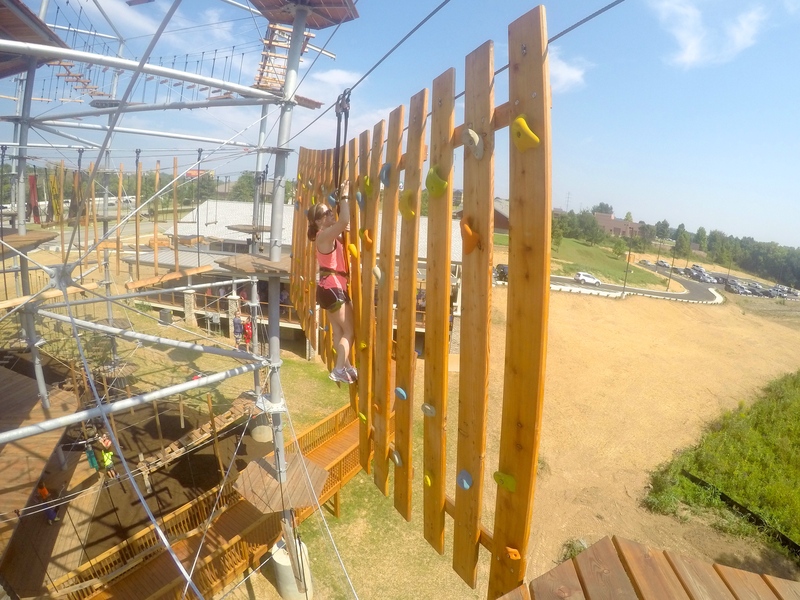 The elements range from rock walls to monkey bars to swinging planks you have to cross. My friend Amy, who has accompanied me on at least 6 prior adventures (the most of which recent being zorbing), drove in from Knoxville to spend the weekend with me. 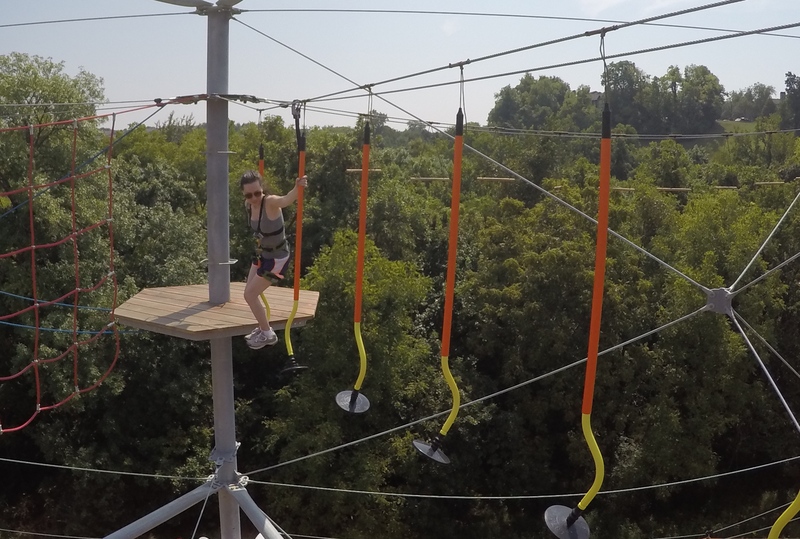 Almost every adventure we’ve had together has required some sort of liability waiver. 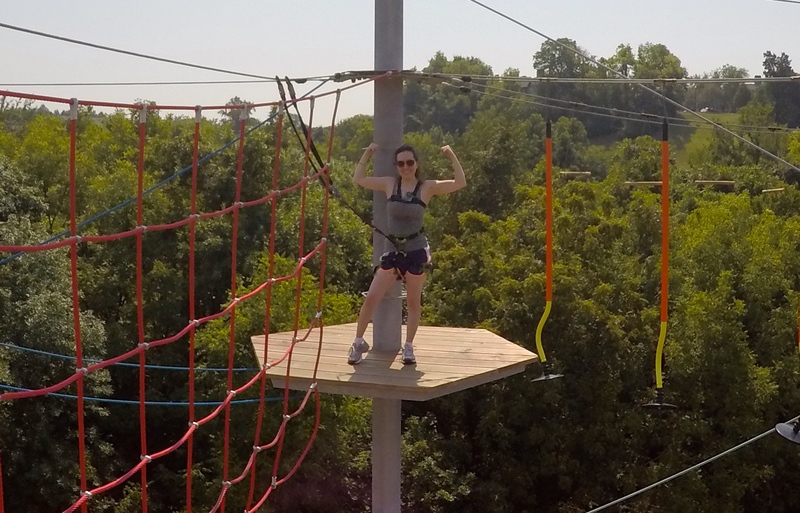 Amy is good at basically everything, and took to the ropes course much more naturally than I did. (See her exuding awesomeness below). We started when they opened at 10:00, partly because it was supposed to be close to 100 degrees that day (yes, in September) and partly because we had a full day of football watching planned afterwards. This is a fairly typical girls weekend for us. One of the first obstacles I attacked was a surfboard. You could either push off the platform and awesomely “surf” to the other side, or, you could do as I did, and awkwardly pull yourself to the other side with a rope. Amy took to things pretty naturally. 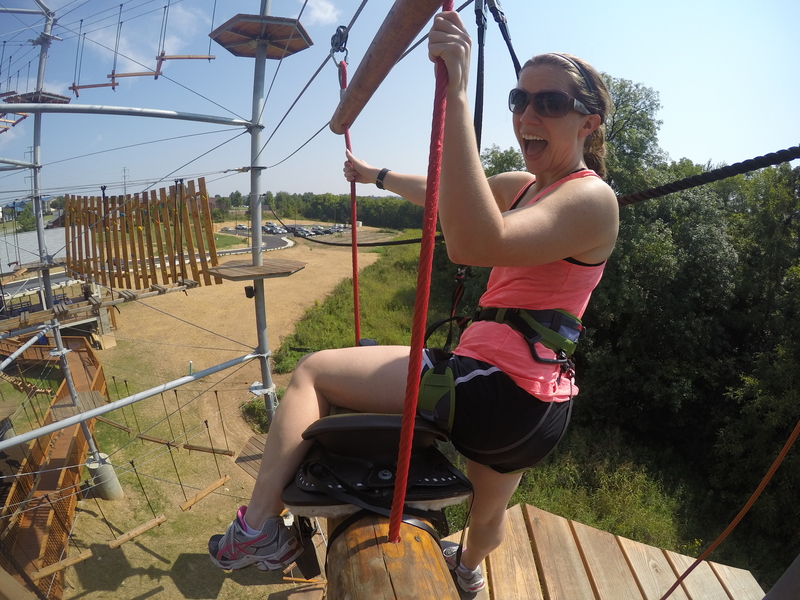 Despite a back injury, she handled the rock wall like a pro. (Amy actually joined me on my very first rock climbing adventure). 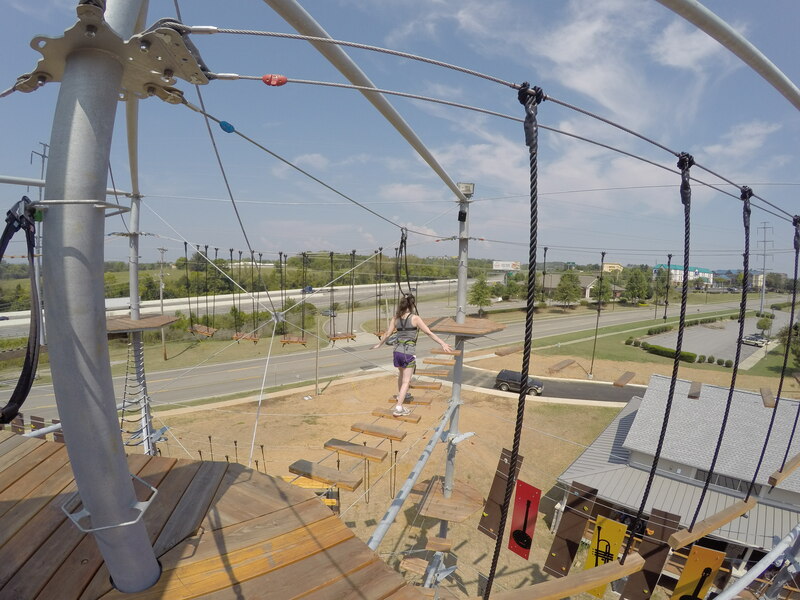 Soar Adventure Tower has a special “fallstop” belay system that keeps you locked in and ensures that the climber is never detached from the safety line. 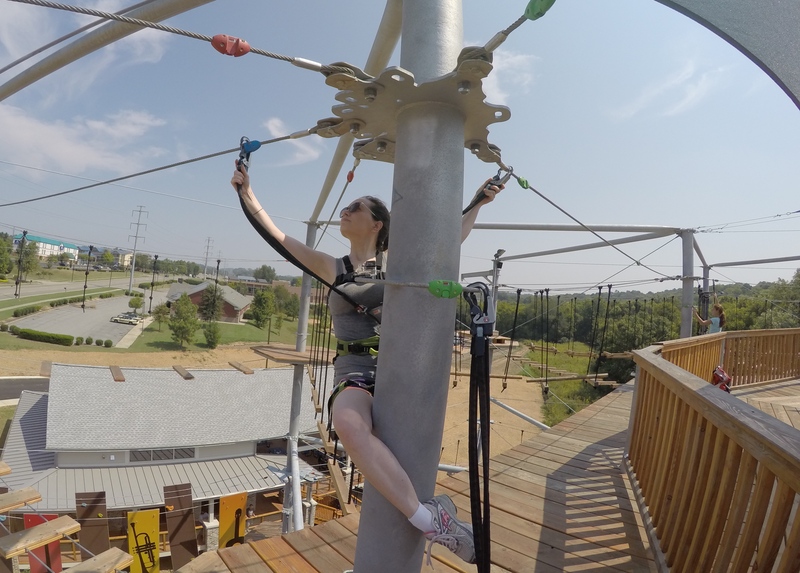 You are attached to the safety line by two carabiners and, once attached, the interconnected carabiners can only be opened one at a time. To unhook and go from element to element you had to push a carabiner into a “Tweezle,” which allowed you to detach the other carabiner and move it to a different line. Being short, I had to get creative about this process and hang on to the polls like a monkey to reach the wires. 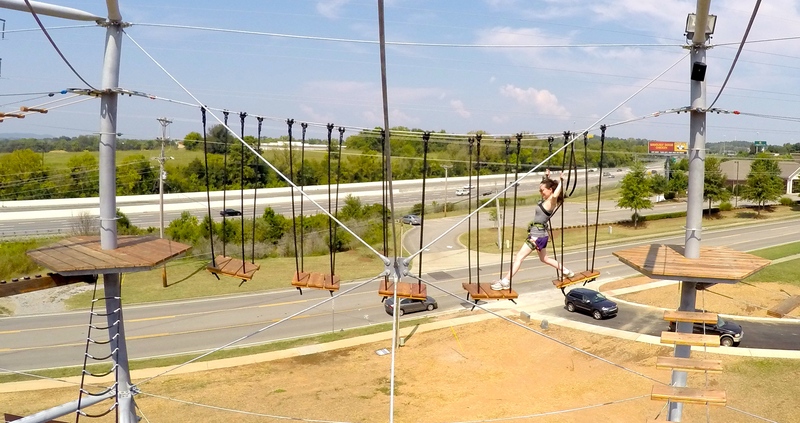 I didn’t really get the hang of things until we reached the top level, 45 feet above the ground. But once I warmed up I really enjoyed it. In fact, some elements I definitely would have fallen off of if I was not harnessed in. 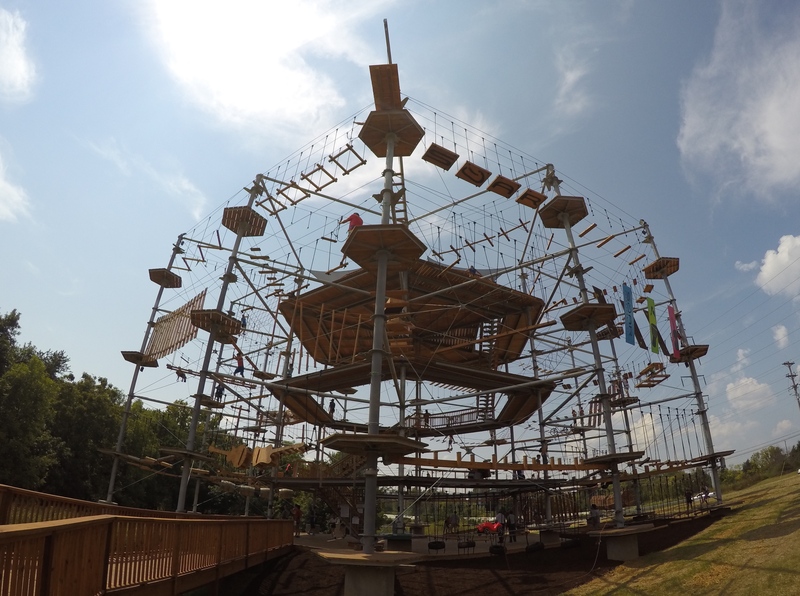 My favorite element was a cargo net on the top of the tower. There was one element I could not complete. 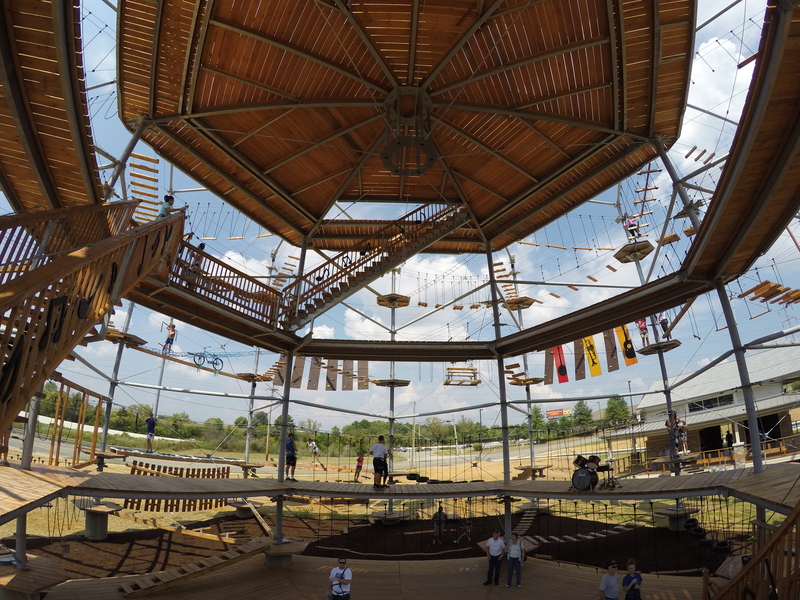 It involved disks that you stood on and you jumped from one pole to the next. Despite some helpful instructions from the staff, I just could not maneuver my way across. However, spinning back and forth on the poll was both fun and hilarious. Now that I know what to expect I’d really love to go back and attempt it again. However, next time I will come equipped with a bottle of water attached to me to stay hydrated. Even just a short time there wiped us out and we couldn’t make it down fast enough to get rehydrated. However, fall is coming and the weather will (hopefully) cool down eventually. Awesome! 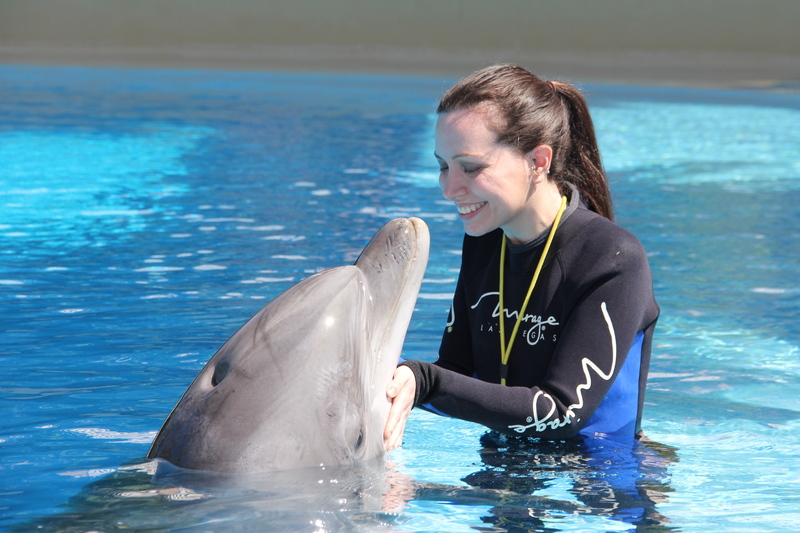 This is something I definitely would never do so it was fun to vicariously enjoy it through your experience! Keep going, life is meant to be tasted. You are such a fantastic writer! I love reading about your adventures. I did something like this with Dale in Tampa and had a fantastic time. 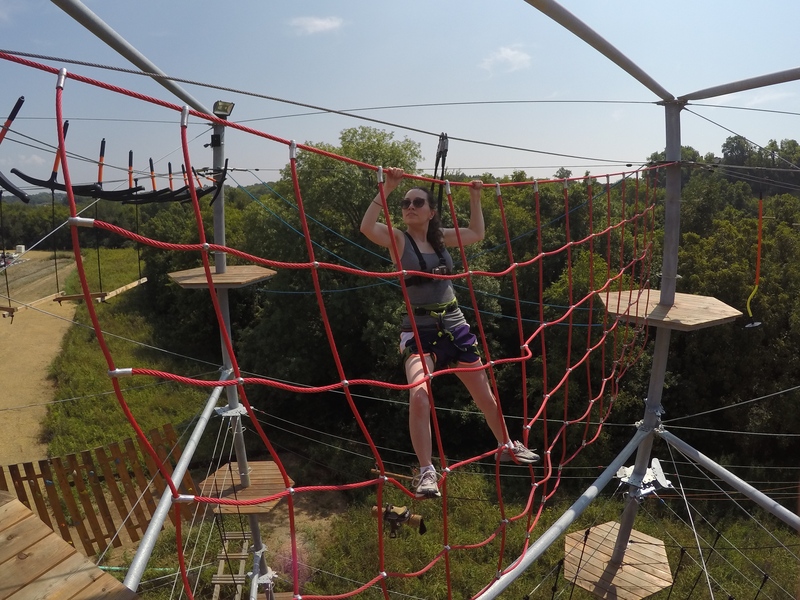 It was a great confidence builder doing things so out of my comfort zone!